Air-Pot Gardener | Growing better plants with Air-Pot containers. If you are an optimist you might dare to hope that the coldest days of winter are past. There are certainly more daylight hours, so if you can provide a bit of warmth and protection it is time to get a few plants off to an early start. 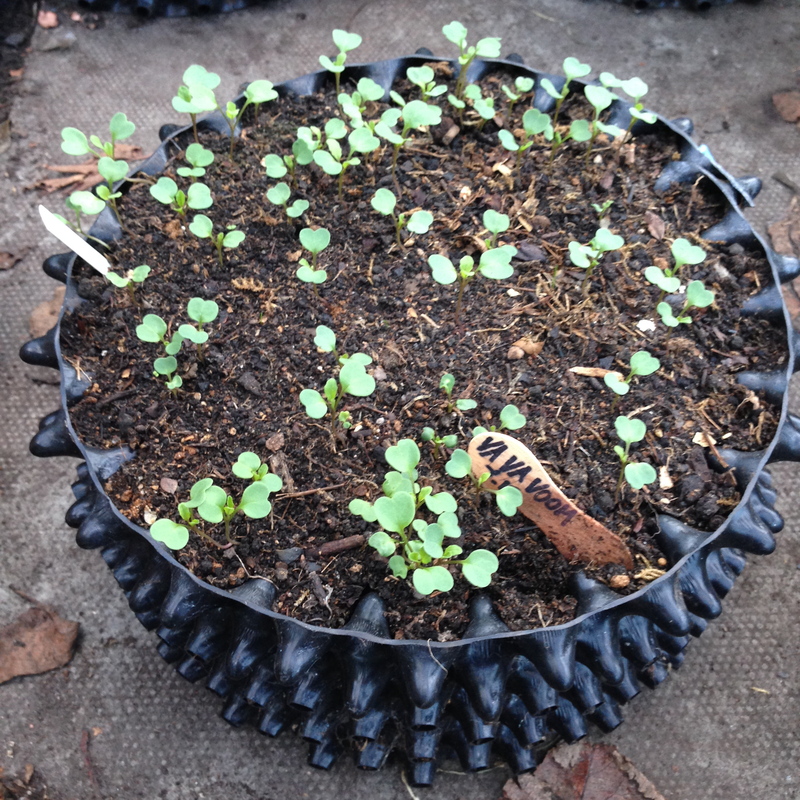 I have sown some radish, and a salad rocket named Va-va-voom, indoors in Air-Pot seed trays, and then moved them to an unheated greenhouse now they have germinated. So soon we should be eating the first salad crops of the year. 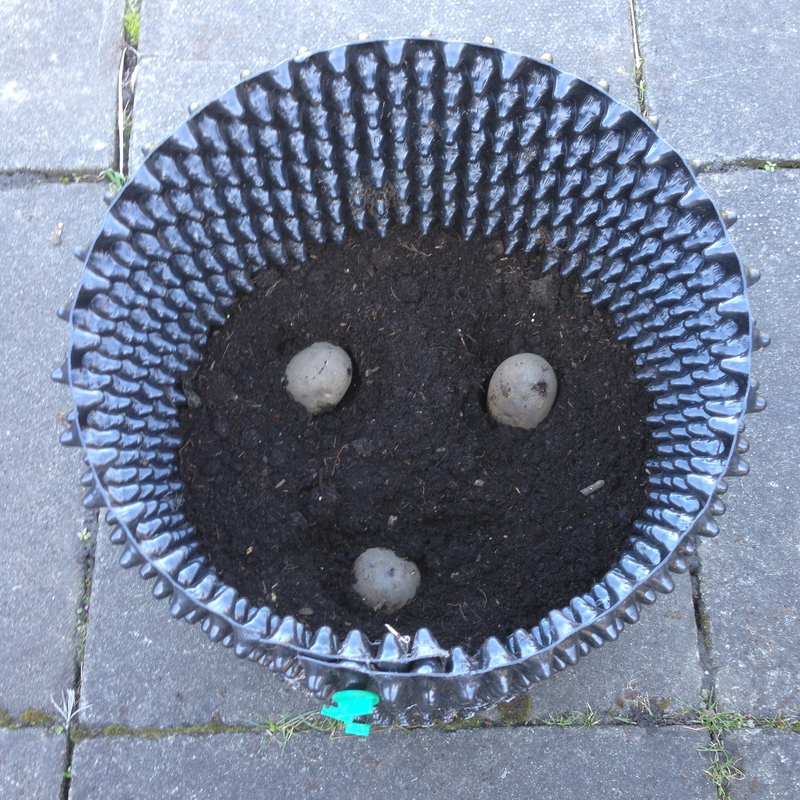 Some Air-Pot potato towers have been half filled with compost and planted with chitted tubers. 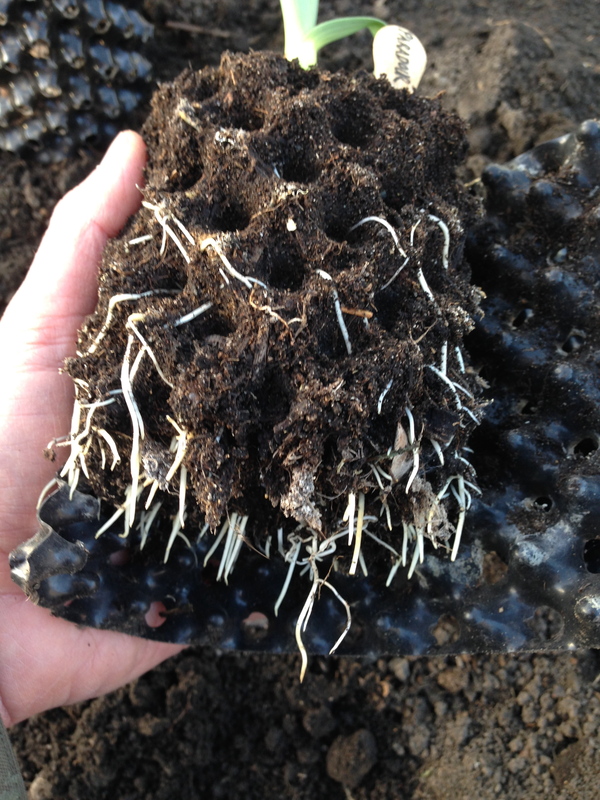 I have put them in a frost-free shed and as shoots emerge earth will be added to cover them. 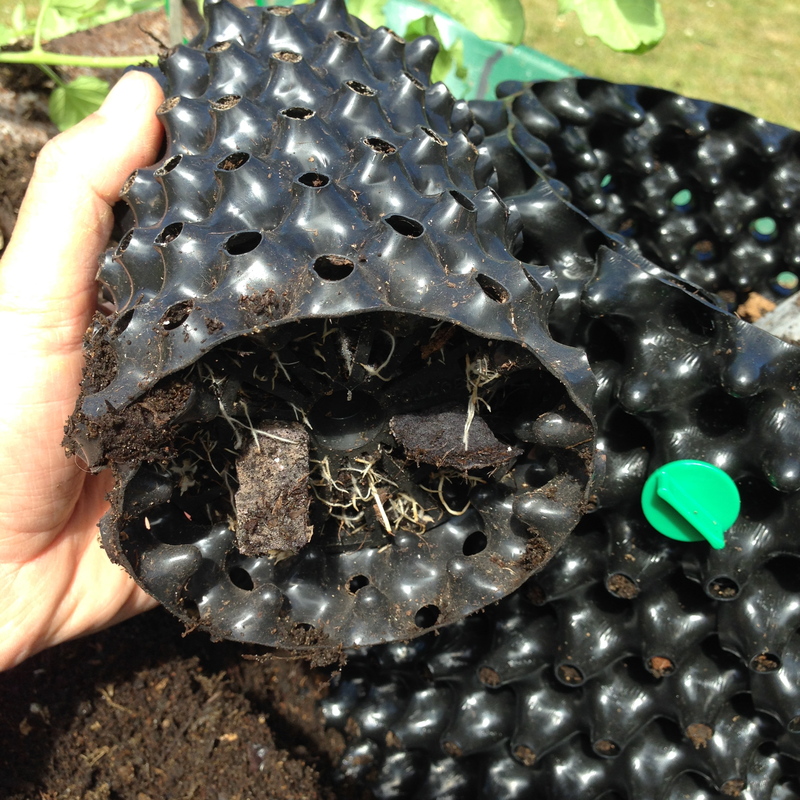 When the pots are full and the leaves are showing above ground, they will go into a greenhouse and watering tubes made from plastic bottles installed. This will allow thorough watering right into the core of the pot. I am hoping for really useful quantities of potatoes from a small area. Plenty of water and nutrients should ensure good harvests and we will be trying for two crops, one after the other in the same pots. I have high hopes for the superb Double Strength Dalefoot Compost which forms the bulk of the potato growing medium.This is a peat-free organic product made from sheep’s wool and bracken and contains a high level of long lasting nutrients. 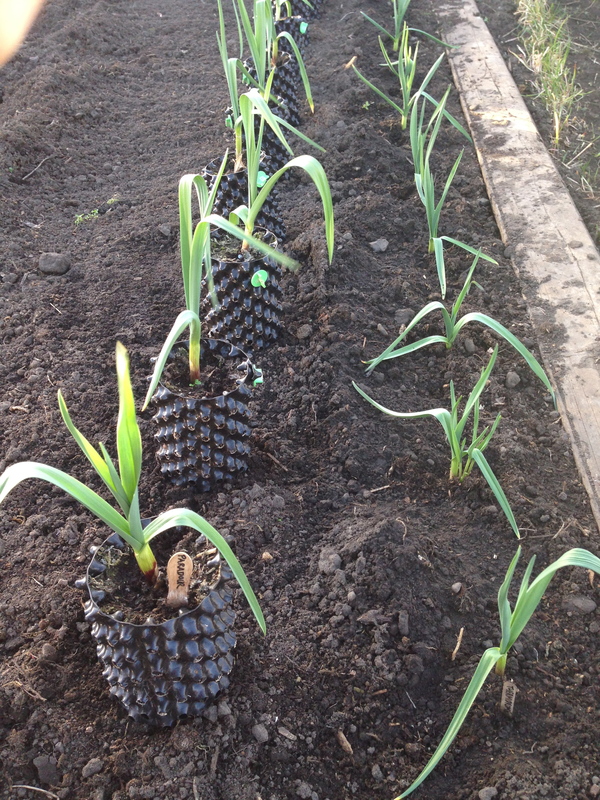 I have planted out some garlic on the plot that was started in one litre Air-Pot propagation pots. Protection from the worst of the winter wet and cold has produced heathy young plants, that are definitely looking much better than my usual bedraggled Autumn planted ones. When garlic and shallots are planted in normal pots or modules the roots quickly become congested, so it was good to see the roots were nicely dispersed through the compost in the Air-Pot containers. A very mild end of the year has meant the last of the tomatoes and chillies have only just been picked and are overlapping with some early sowing for next year. Various bulbs like shallots and tulips have been planted in pots ready to push forth; in fact some green shoots are already showing. But the main event at this time of year is sowing of onion seed. It may seem early to start onion but I have managed to get some seed from prize-winning strains of heavy onions and to stand a chance of growing into really heavy bulbs they need an early start. I don’t expect to break any records but I know the heaviest onion and leek at the last Harrogate Flower Show were grown in Air-Pot containers, so I am keen to see how big I can grow. 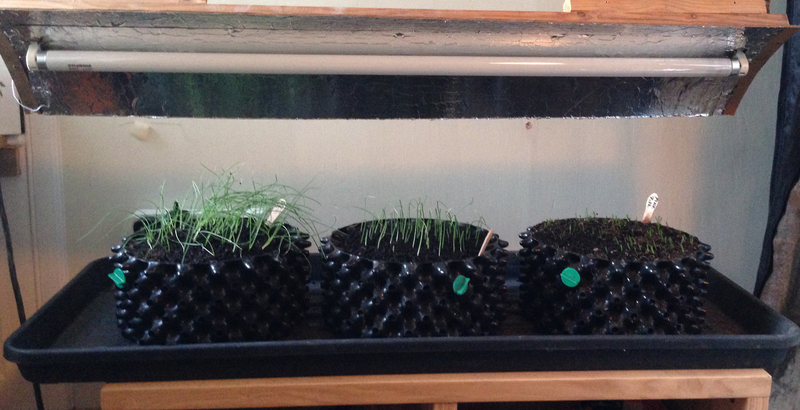 Only moderate heat is needed to get onion and leek seed germinated and once growing they can tolerate quite cool conditions, what the young plants do need is high light levels. A lot more than we have naturally during the gloomy short winter days we are experiencing, so I have dusted off a couple of fluorescent tube fittings for the plants. It is well worth rigging up a well lit sowing station and this set-up is not expensive, I had a couple of salvaged three foot long tube fittings and bought Gro-Lux T5 tubes which emit the wavelength of light needed for plant growth. A simple reflector can be made by glueing aluminium foil to hardboard then the whole contraption needs to be suspended over the seed trays. Using two chains attached to overhead hooks allows the height to be adjusted, the light should be as close to the plants as possible. A big piece of silver Mylar can be draped over the fitting (I used a survival poncho) hanging down both sides of the growing area to create a mini grow tent. A length of cord between the chains can be strung across to form a sort of “clothes-line” for the Mylar. This maintains a space between the Mylar and the light fitting. It is probably better not to have the reflective sheet directly wrapping over the back of the light just in case this causes overheating. My single 30 Watt tube generates a gentle heat which the plants enjoy, but never enclose any light fitting which generates a lot of heat. The onion plants are getting 24 hour a day light for now, once they are well established and potted-up individually a timer will give a more natural day / night cycle. Germination in the small Air-Pot trays has been very good and I feel the roots will develop well in these for quite a while, but I know the top growers separate plants into individual pots soon after germination. So the best plants will be potted-on individually, but many others will stay hugger-mugger in their trays until they can be planted in the ground. After onions are moved-on of course a warm brightly lit space can be useful for getting a succession of seedlings off to a good start, such as Spring sowings of chillies, peppers, squashes and tomatoes. 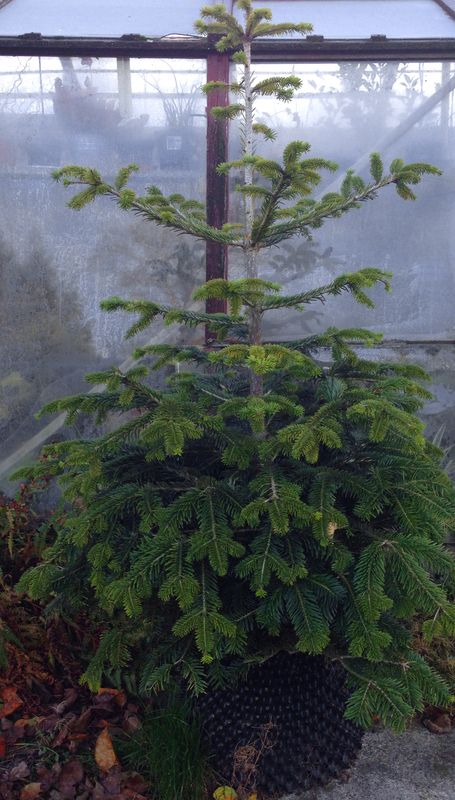 I am pleased to see that my Christmas tree in an Extra-Large Air-Pot has survived another year and is pressing up at the glass at the back of the house keen to come inside for the Festive Season, this will be its forth year with us. The end of the growing season seems to be extending later than I’ve ever known; after a few cool spells we have had pretty mild conditions. 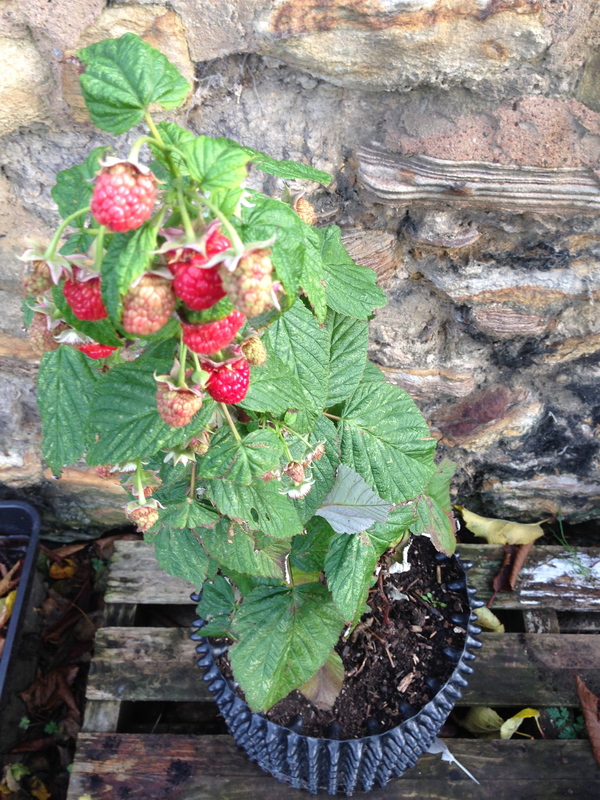 I still have ripe raspberries, I even have ripe outdoor tomatoes here in Scotland in mid November. In previous years I’ve known tomatoes to freeze solid in mid October. 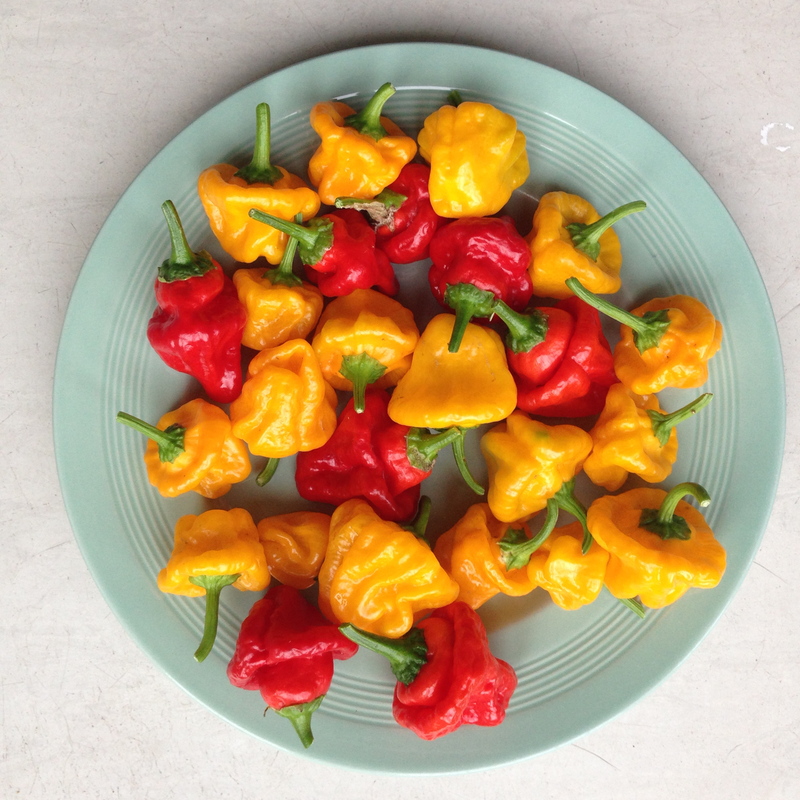 Lots of the chillies are still ripening including an accidental cross which has produced lots of attractive hot yellow pods. 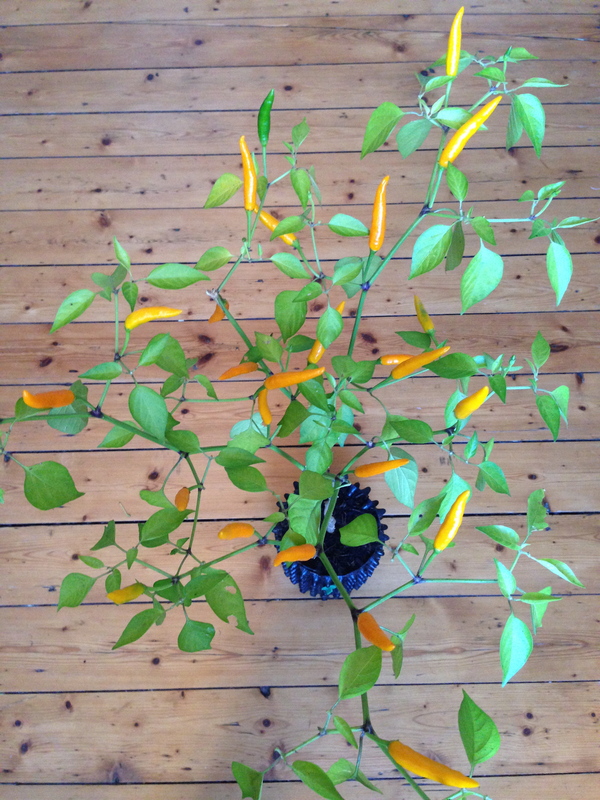 I saved seeds from a typical red podded piri-piri chilli plant a couple of years ago, but the plant which grew from that seed last year was a bit off type, and seed saved from that plant has now produced pods completely the wrong colour. But it is a great grower with bigger pods than its Grandma, so I made a batch of piri-piri sauce which was excellent on chicken wings. I expect the original true Portuguese piri-piri plant crossed with some yellow podded chilli in the greenhouse such as Bulgarian Carrot. I like the very erect tall habit of the new plant, which comes from the piri-piri genes, and the big pod is much easier to de-seed than the little piri-piri ones. It will be interesting to see how the next generation turns out. Talking of chilli seed, I did a little viability test of some saved seed, mainly to check the quality of the seed, some of which was rather old, but with an idea that I might get a few plants established extra early. I put a few seeds into folded moist paper towel, in a plastic container in the airing cupboard. 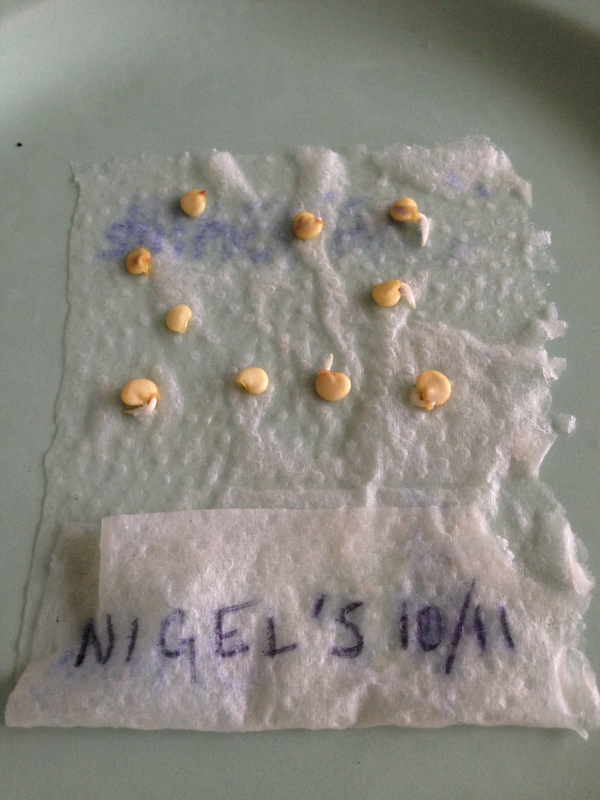 After just four days the Nigel’s Outdoors chilli seeds are the first to germinate. As they have proved so keen to get growing, and they are usually about my earliest to ripen, I will get them into soil and hope for super precocious ripe pods.Thinking ahead to next year spurred me to do some Autumn planting of bulbs. After clearing most of the greenhouse plants out I planted up some of the bigger vacated pots with tulips and muscari (grape hyacinth), I look forward to these providing a bit of Spring colour. 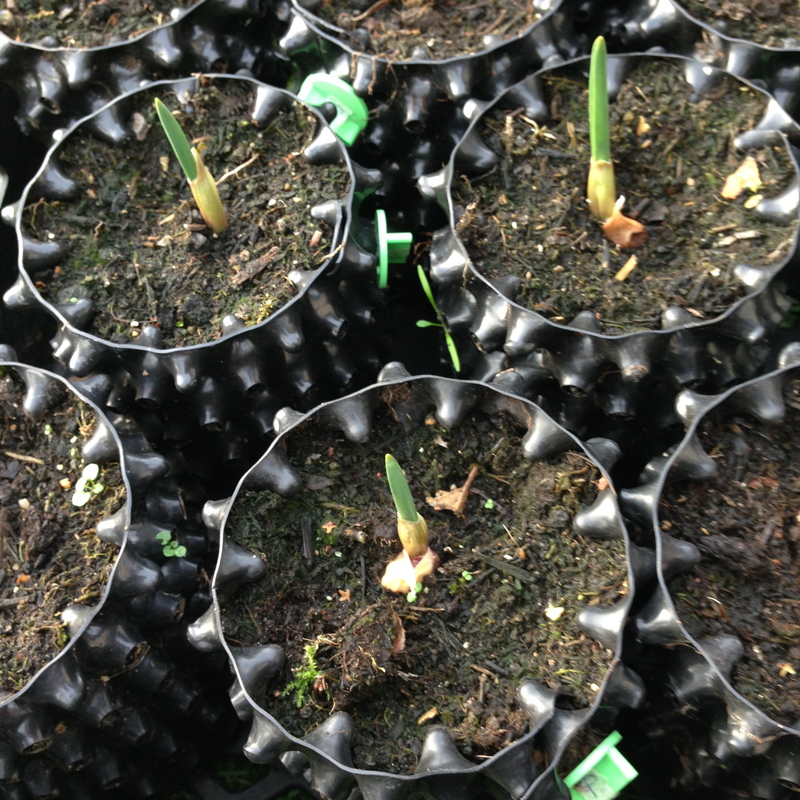 Also, a lot of garlic cloves and shallot bulbs have been started in 1 litre Air-Pot propagation pots. Many people start these straight into the ground but I have had problems on the plot with rot over winter, so I will try starting in pots, and will move them under glass during wet spells. Eschalote Grise the prized French shallot has completely failed previously when outside through a Scottish winter, the good drainage in the pots should give these fickle French alliums a better chance. The tomatoes and peppers have loved the hot summer this year.and have been ripening since June for me. 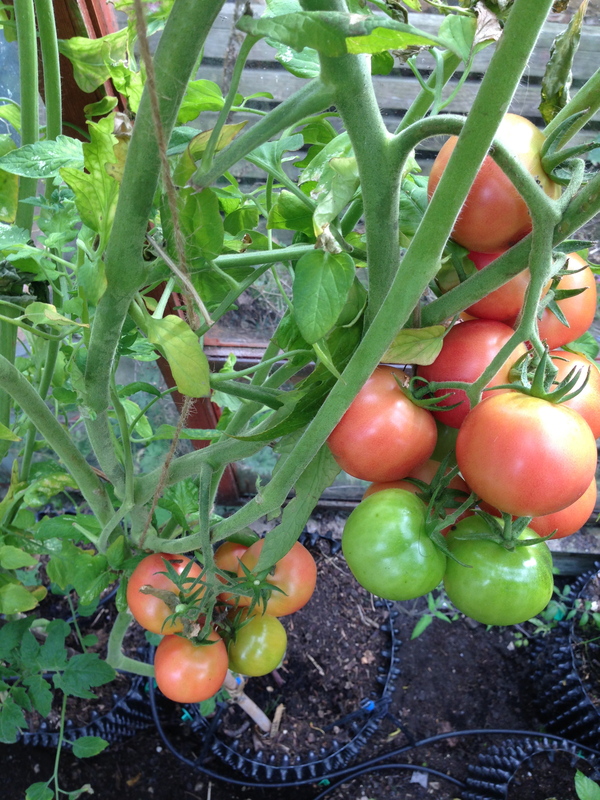 The first to ripen were quick maturing types like Stupice, in medium sized pots. In large pots the main crop of heavy producing types has been giving big yields through September into October. Montello a small oval salad tomatoe has been prolific, the best beefsteak Pantano di Romanesco. Amish Paste has provided lots of passata for freezing and bottling, and now I am picking De Colgar which is an exceptionally long keeping storage, or hanging tomato. People often ask which size of Air-Pot is best for growing tomatoes and based on my results I think the large 20 litre gives best results. The plants are bigger with more space around them for light to penetrate and air to circulate. The medium 9 litre size can be useful for the lower determinate types and early fruiting plants, which can be cleared out of the greenhouse later in the season. 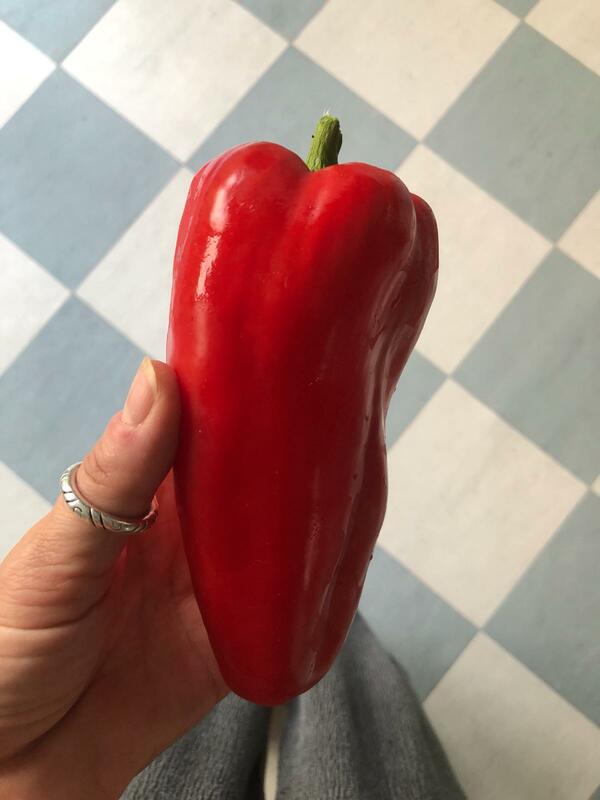 A sweet pepper named Cabanero was my biggest capsicum of the season. An odd shaped chilli which came to me labelled Jamaican Red Hot has indeed been hot and red on one plant, but yellow on another. They all tasted good and went into a batch of chilli jam made to my favourite recipe which includes onion, garlic and fish sauce. As usual I grew so many chilli plants that I ran out of space so most chillies stayed in small 3 litre pots, by way of contrast up at Air-Pot HQ in the big poly tunnel a Carolina Reaper was grown in a medium 9 litre pot and produced 100 pods. These are the hottest in the world so should produce enough heat for several lifetimes. 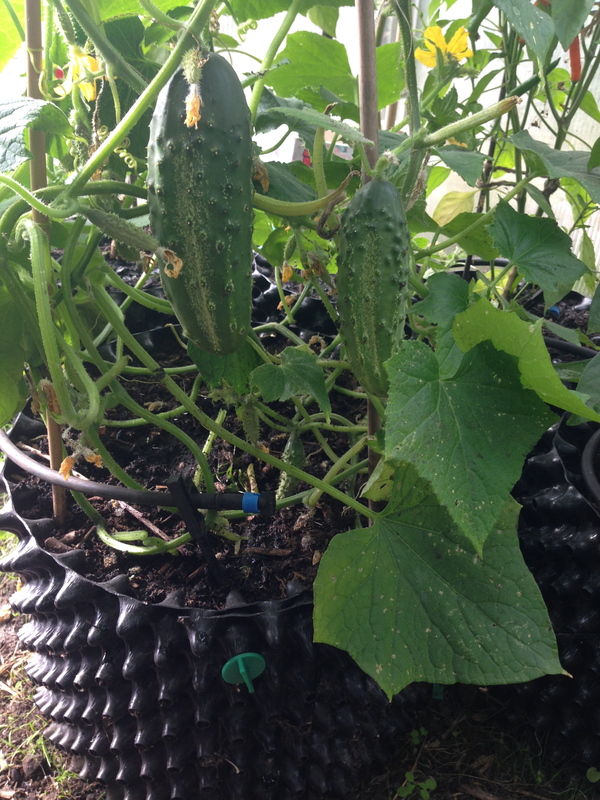 I have been impressed with the amount of cucumbers a couple of Air-Pot containers can produce. 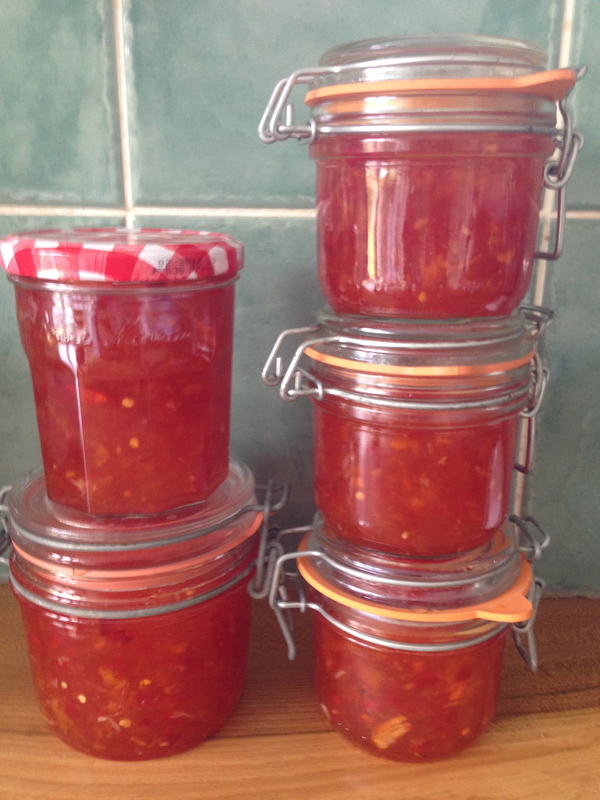 Enough to eat loads in salads, make endless gazpacho soup and also pickle in vinegar. Previously I have bought the very expensive F1 hybrid seeds and put one plant in a 20 litre Air-Pot. Sometimes several flushes of beautiful cucumbers result, but if the one or two precious plants succumb to some ailment all is lost. 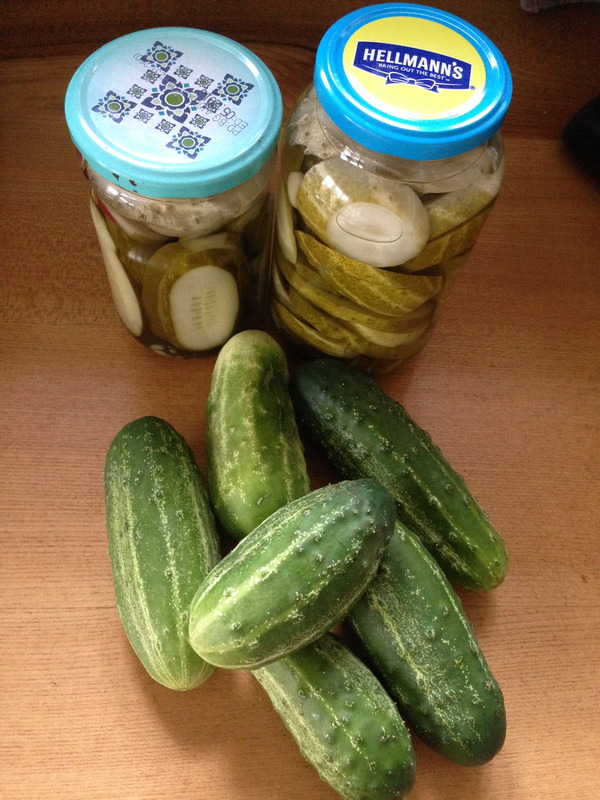 This year I sowed lots of cheap Polish ridge type cucumber seed and planted three in a pot. They are in the greenhouse scrambling up a trellis and seem more robust than the thin skinned all-female English types. Admittedly they are small (about 15cm) and are a bit prickly but the yield is huge and staggered, and the prickles rub off easily. Some plants are probably not as productive as others but that does not matter when there are several plants in a pot. So lots in a pot will be my method in the future. The yield has been good from an Air-Pot potato tower that has been on the patio after an early start in the greenhouse. Rather than open it early and risk a lot of the tubers still being very small it has been left until well into July. Three Casablanca tubers planted in a pot have produced 3.5 kg which is more than I get per plant when grown in the ground. Three plants at the plot would generally produce 3 kg & take up an area about 1 metre square, whereas the potato tower has only a 42cm diameter. 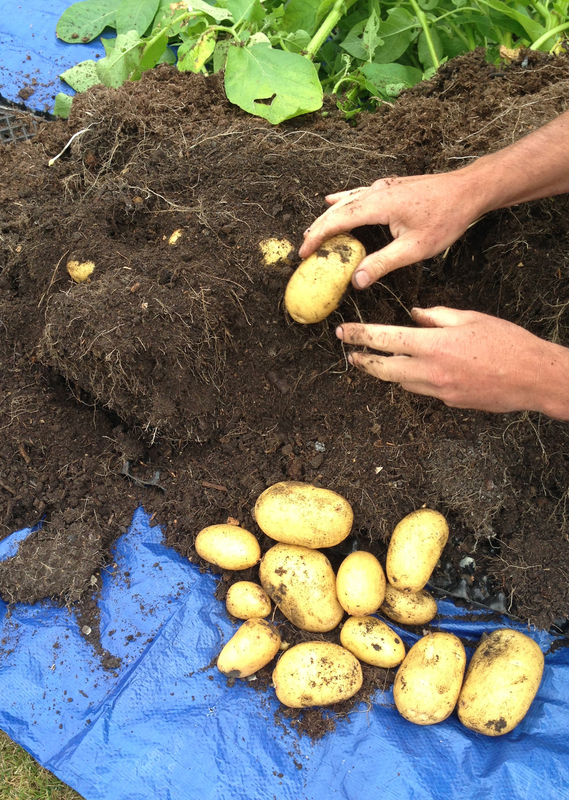 So with four potato towers fitting into one square metre small spaces can be very productive. The key to success has been plenty of water. From the early season to this point in high summer there has been a lot of potting-on and this post is about filling Air-Pot containers, together with some observations and tips based on my experience of using them. Once the pots are properly assembled, ideally the right way up and not inside out, it is time to fill with compost / potting mix. Something water retentive that is not too free draining is good. It is very important to pack the growing medium into the container firmly, without leaving pockets of loose soil or voids. This is so water does not find quick routes to gush out of holes before it can be absorbed. Also the best development of air-pruned outward pointing roots can only be achieved if soil is filling the cones. 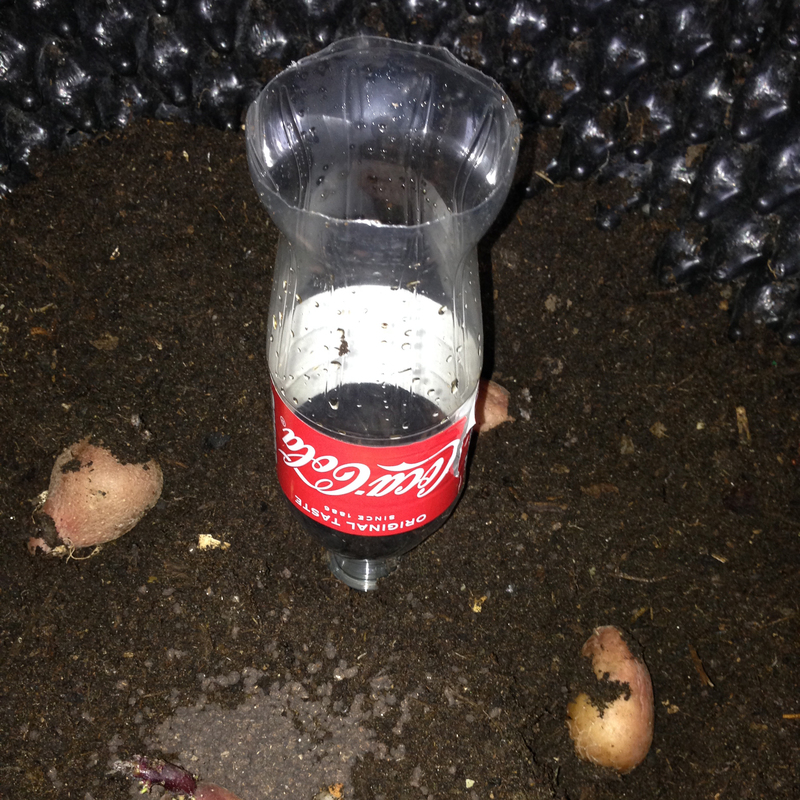 I have found the small 1 litre prop pots are particularly easy to under fill, perhaps because there is simply less weight of compost to compress downwards. I have often lifted a small pot to see large voids, sometimes with a slug in there leering out at me. So now I use a round ended trowel to jab downwards and outwards. Initially loosely fill the pot about half way. The trowel can be used to jab down onto the base and into the corners. 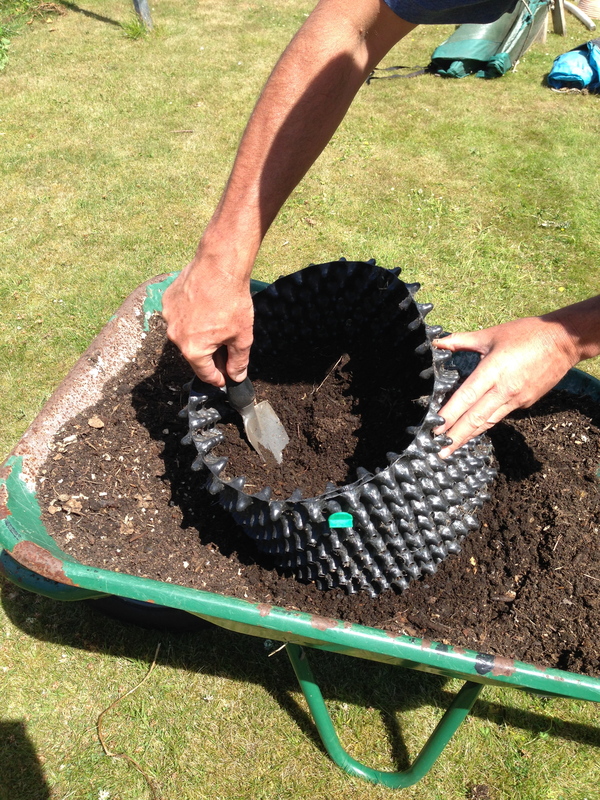 Then using the back of the trowel sideways press soil into the cones. Then the pot is filled right to the top, tamped down and the trowel again used to press soil sideways. If you are moving a small plant into a larger container the initial partial fill and poking with the trowel is still the way to pack earth well into the bottom of the pot. After setting the small rootball in place the space around is filled and again well tamped down,; this can be done by lifting and dropping a short distance onto a solid surface, and the trowel used to work soil into space and cones. Finally I work around the very top pressing down the earth with thumbs to make sure water cannot easily sneak down through loose earth at the outside edge to a hole. I find it helpful to insert a strip of capillary matting up through the base to act as a wick, especially in small pots which might be packed onto a large tray. This just means water can be absorbed from below if necessary. This is not how Air-Pot containers are designed to be used but together with top watering I find it works well in my grow tent and greenhouse for annuals, like tomatoes and chillies.